We both woke up around 4 am (6 pm "our time"), but that was a pretty good sleep for us. At 6:10 Karen began the day by ordering coffee from room service, then tipping the waiter ₯ 100 for a ₯ 40 pot of coffee. That would have been a $2.50 tip on a $1.00 purchase. Which might explain why his eyes bugged out. 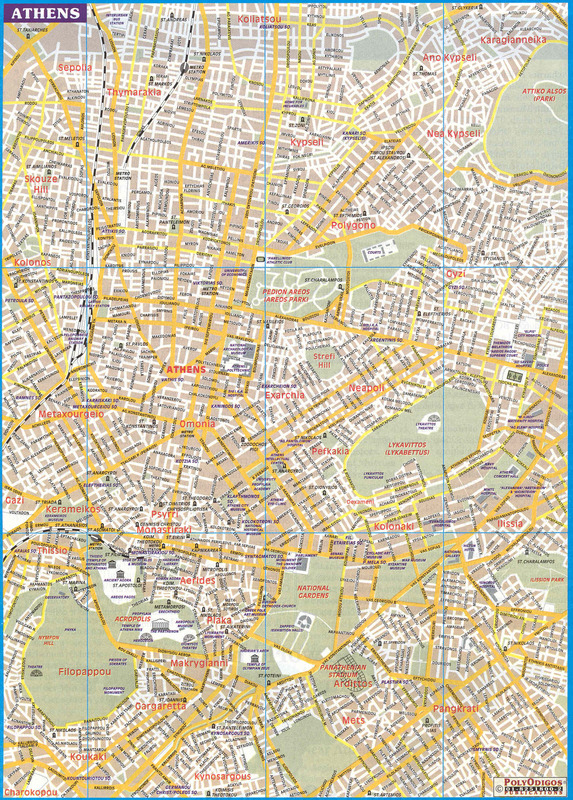 We left the hotel (lower left, D3, map #3, just south of the Temple of Zeus) at 6:30. It was still dark, but the streets were already buzzing with life. I stepped over - fortunately not on - fruit sellers setting up their stands. We followed a street into the Plaka (C2), then walked along narrow sidewalks. At one point Karen looked up and saw what initially looked like a medieval fortress high on a hill. She tapped me on the shoulder and said "Look up" (it was taking all my effort to concentrate on where my feet were headed). The first rays of "rosy fingered dawn" were turning the distant, lofty object a dazzling pink against the dark grey all around us. It was, of course, our first glimpse of the Parthenon (D2), peeking over the edge of an incredibly high (512 ft) Acropolis. It was truly stunning. We walked toward it and then along Dionysiou Areopagitou (all this is D2 on the map). Walked up a narrow street on the east side of the Acropolis, saw a great many cats, heard a rooster, met one American, came to a dead end. 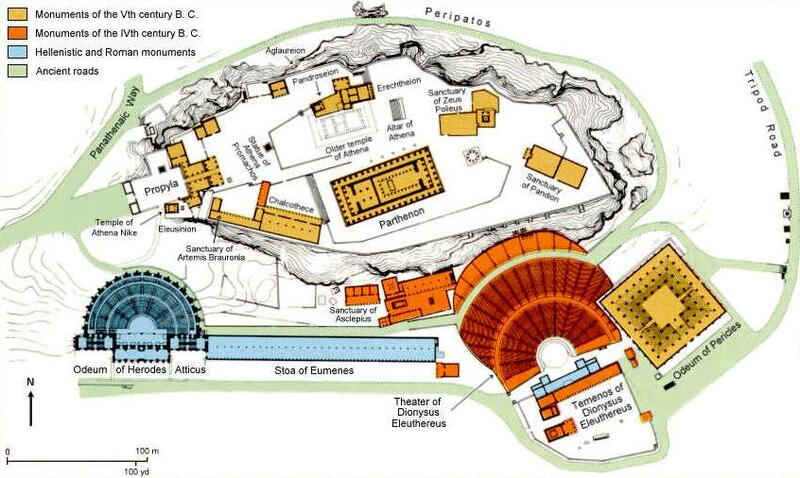 Back down to Dionysiou, followed it along the side of the Acropolis to the Theatre of Herod Atticus. We then found a path which led to the entrance of the Acropolis, only to find it closed. We walked back to the hotel. 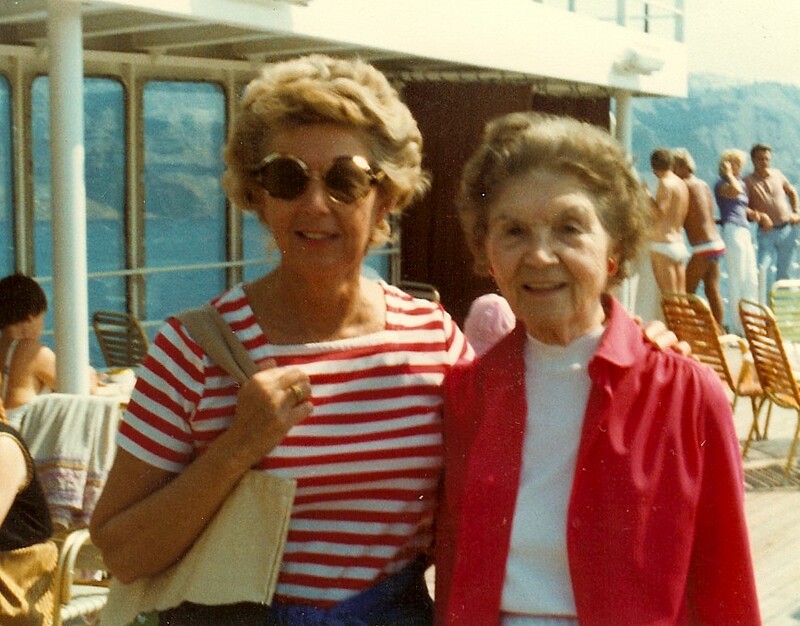 We shared a continental breakfast with the Baileys, Alice (Seattle) and Valerie (Glendale). 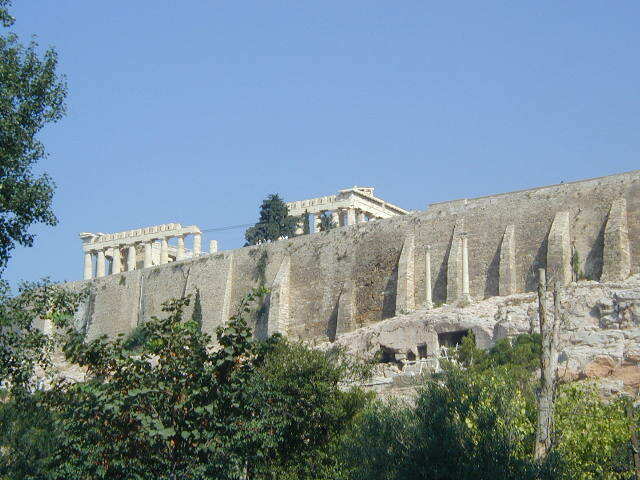 After breakfast, about 9 am, we took a bus tour to our old stomping grounds, the Acropolis. We hiked up through what would have been the Propylaea or entrance. 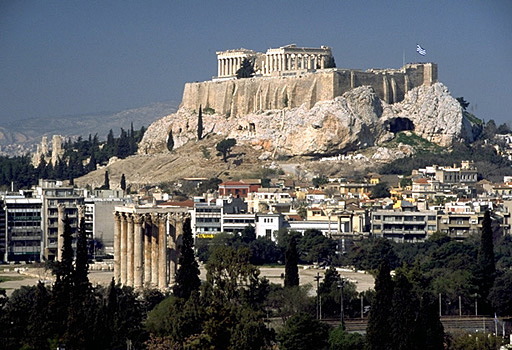 There's a pretty good Discovery Channel video about the Parthenon. 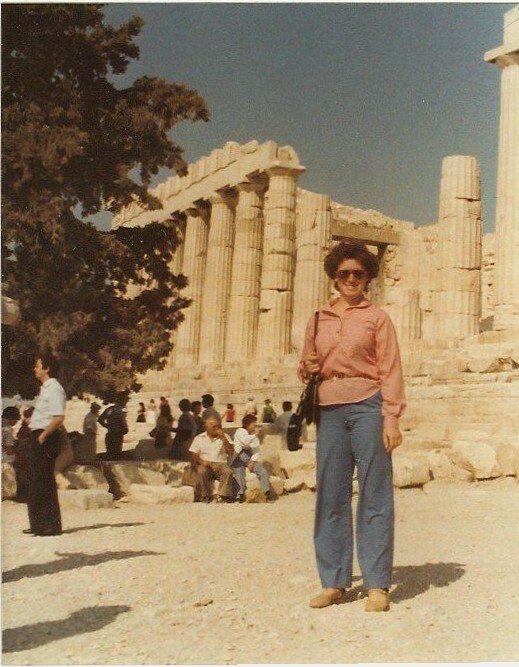 No book - no written or photographic description - I've ever seen has done justice to what I felt just standing there in front of the Parthenon or walking around it. The building, or what's left of it, is truly massive (229 ft long, 101 ft wide - about 2/3 of a regulation soccer field). It's a shame the statuary (at the Erectheon, e.g.) had to be replaced with copies in order to protect it from the high sulphur content of the fuel used for heating in the Plaka. If we devoted just one percent of what we spend on weapons to preserving such.... Well, we won't. Then, about 11:00, we went across town to the National Archaeological Museum (A2). 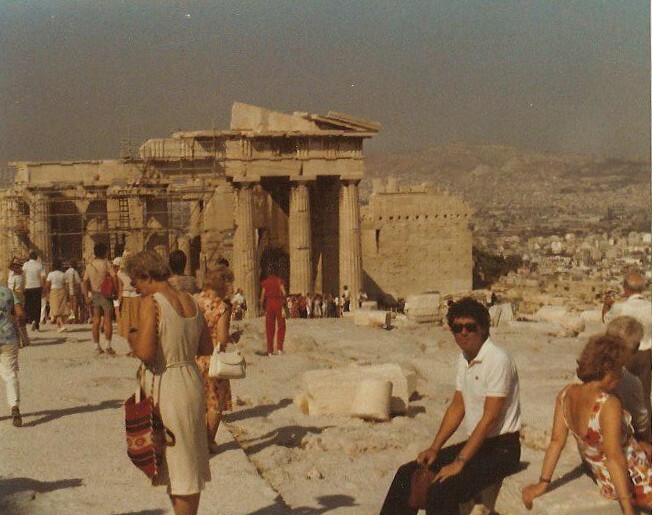 Rick Steves, unavailable to us back when we did this, says the Acropolis and Museum deserve a half day each. He's right, but we did each in about an hour. Christina gave excellent, if fast-paced, lectures in both places, but I left really wanting more. 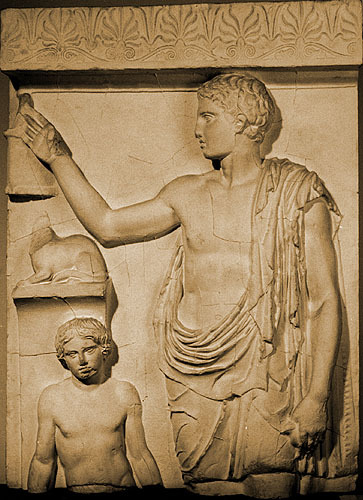 I was particularly struck by the funerary stele, especially the one shown here. As usual, the photograph doesn't do it justice. The deceased ephebe (young man) is shown holding a bird in his left hand while reaching with his right for a birdcage. His servant looks out mournfully, while his cat crouches on the shelf (or is it the urn?) in the background. There is much more to the museum than is suggested here (statues, pottery, jewelry, weapons and utensils, for example). I'll show some of the materials in the context of later parts of our tour. These figures are arranged in roughly chronological order. 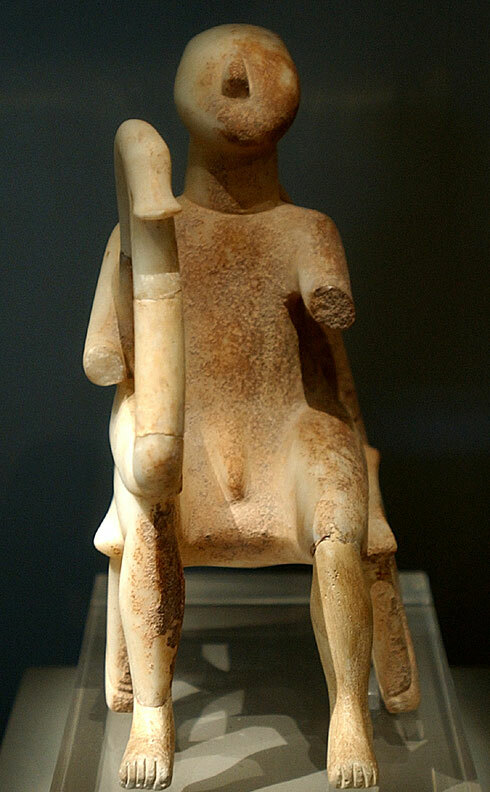 The harp player and idol are Cycladic, 2800-2300 BC; they could have been done by Modigliani (early 20th century). 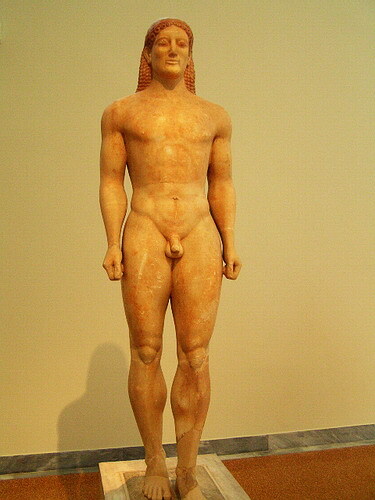 The kouros and kore date from 600-686. The Poseidon, shown w/o his trident, was sculpted in 460. The funerary stele, found on Salamis, dates from 430-420. 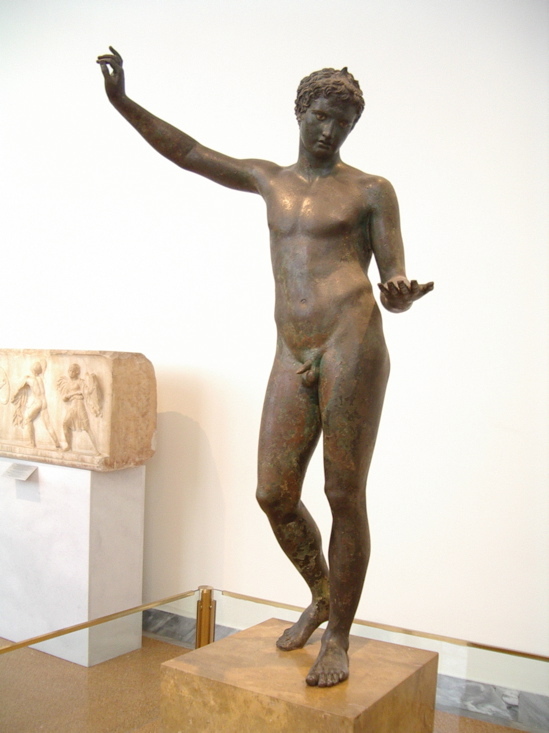 The Antikytheran Ephebe is about 340. Augustus Caesar (once mounted, holding reins in his left hand) was made around 10 BC. The Bus dropped us off at Syntagma Square (C3). This is where they have a ceremonial "changing of the guard" in front of the tomb of the unknowns. There are some videos here. We had a horribly long wait at the American Express office, trying to exchange an American Express travelers cheque for drachmas, and finally gave up. We went to a nearby bank and made the exchange in a few seconds. We had lunch -- sandwiches and Amstel beer -- at the Toulouse Lautrec sidewalk cafe. Refreshed, we began to feel human again. We then walked past the University (lower right, B3) and Eye Clinic and Academy of Fine Arts buildings (both upper left, C3). Then it was back to the hotel. It was getting hot and muggy, so we took a 2-hour nap at the hotel, then returned to the Oasis where we had Greek coffee (thick and sweet, with a layer of inedible dregs ... delicious!) and wrote postcards to our friends. The vegetables we saw being loaded into the fruit and vegetable stands on the street came in long plastic bags. 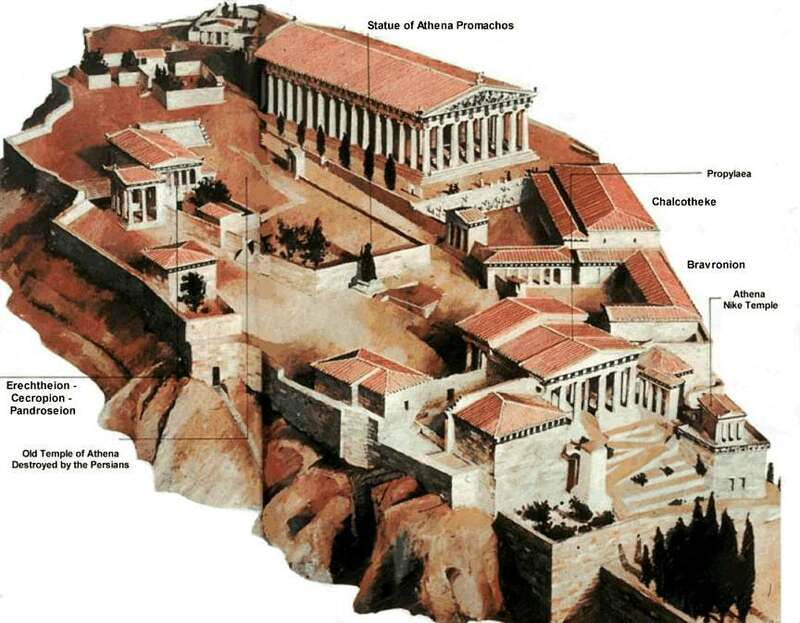 Guards at the Acropolis blow sharp whistles to warn people away from the Parthenon. Greek traffic cops seem to be able to toot arias on their whistles. It's fun to watch them perform amid the rapid, crazy traffic on Amalia Avenue (Vas. Amalias), literally pulling in their butts when the traffic begins behind them. Not a career for the faint of heart. We were both excited by number and variety of different nationality groups visiting the Acropolis. Its hard not to contemplate the fact that people from all over the known world, famous and otherwise, have been climbing those same stairs to the Acropolis for over 2,500 years. We went to the Plaka tonight with the group to a taverna called Mostou. There we had dinner in the roof garden. We had ouzo (clear when it's neat; cloudy over ice) and a good white wine called Santa Marina. There was music and entertainment. First song up: "I Left My heart in San Francisco". As with Paul Harvey yesterday, we didn't come here for that. But the rest of the entertainment was fun. We all got corralled into a chain dance through the taverna with the other members of the group. That was fun. Karen was chosen to dance with one of the Greek performers. It was exhausting, and she kept worrying that one of her shoes might fly off and land in someone's drink. The whole evening was great fun. We were back out on the street around midnight. Some guys on a motorcycle approached, and there was a moment of nervousness until they called "Hallo Ameriki" and rode off laughing. Some members of the group bought shawls from two dramatically pathetic old ladies who were lying in wait for us, dressed in widow's black with black shawls and street dirt rubbed on their faces. At ₯100 ($2.50) the shawls looked like a good deal. We learned later that, in the light of day, they weren't. Back at the hotel we had a beer and were joined by Harold and Betty Denison from Tampa Bay. Did some laundry and went to bed.